"A Marine & Seaman fishing off the Anchor on board the Pallas in Senegal Road, Jany 75," Gabriel Bray, 1775, National Maritime Museum. 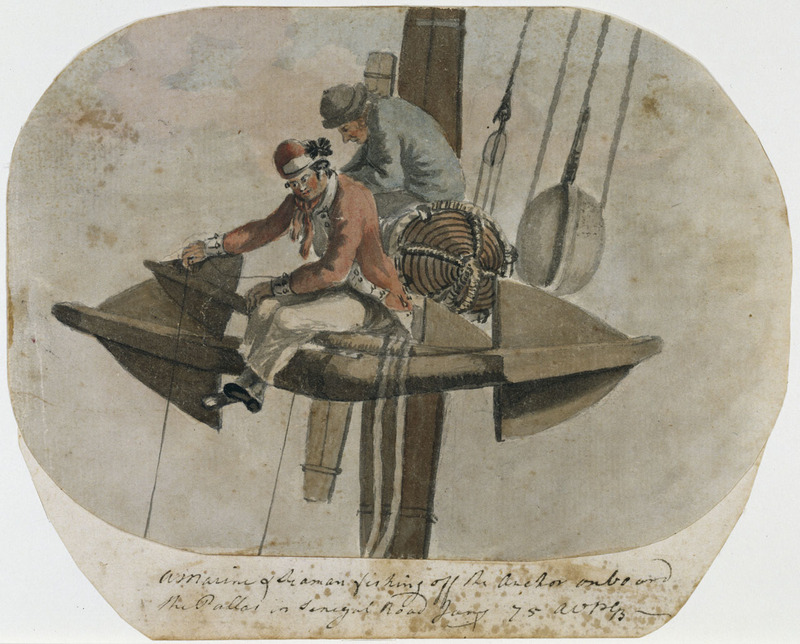 Gabriel Bray's works are often noted, not for the sailors he portrays, but the marines. British Marines, especially aboard men of war, are fairly rare images. Unlike sailors, marines were never stand ins for Britain in political cartoons, nor the common subjects of caricature. In this watercolor, Bray shows us both a sailor and a marine sharing a seat atop a pair of anchors while fishing. 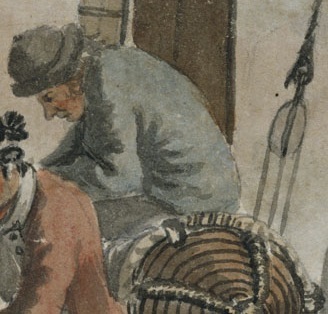 Fishing must have been a popular pastime aboard the Pallas as this is one of at least three images of the sport in a mere two months. Our sailor wears a Monmouth cap, short scraggly hair, and a black neckcloth. His coat is a light blue, perhaps a powder blue. Lighter colored garments were cheaper than darker ones, so this was probably a fairly common color, although most prints depict darker blues. The seaman's trousers are off-white, but we get no further details.